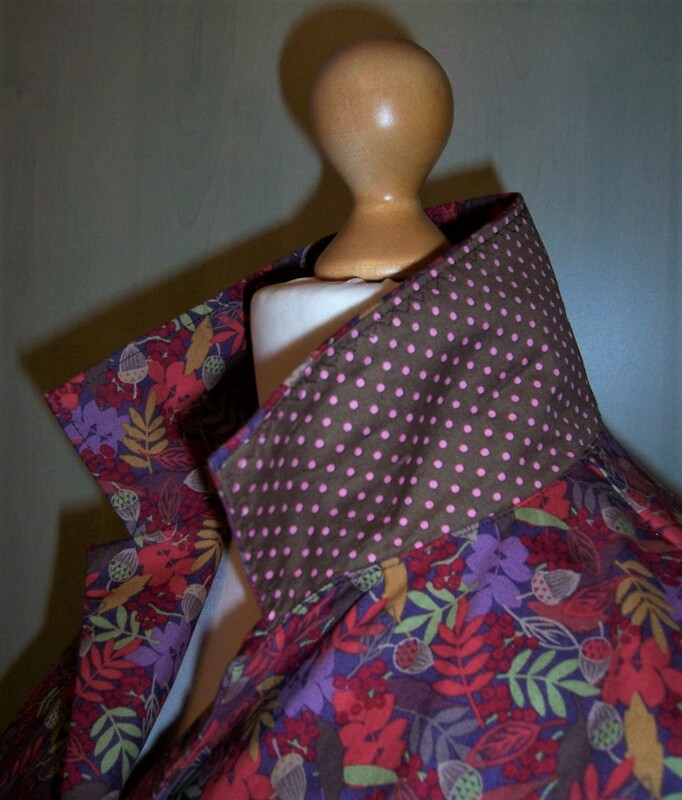 I have finally started dressmaking again. This time yet another sleeveless shirt dress using ‘Anaconda’ printed cotton lawn. 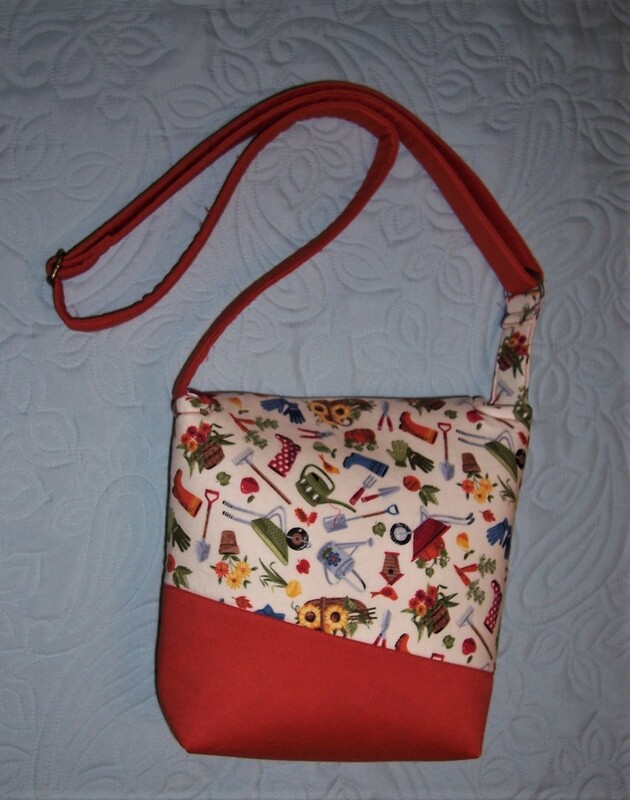 But before I post details of that dress, I want to tell you about my latest bag construction – the Companion Carpet Bag by Mrs H patterns. The Companion Carpet Bag features a full width front pocket, which you can trim with piping or lace, bag feet, leather handles and optional leather snap tab. Inside there’s a zipped pocket and a slip pocket. The pattern uses an internal tubular frame, either 8.5″ or 12″. You don’t need the top snap tab as the frame holds everything closed nicely, but it’s a great accent feature! 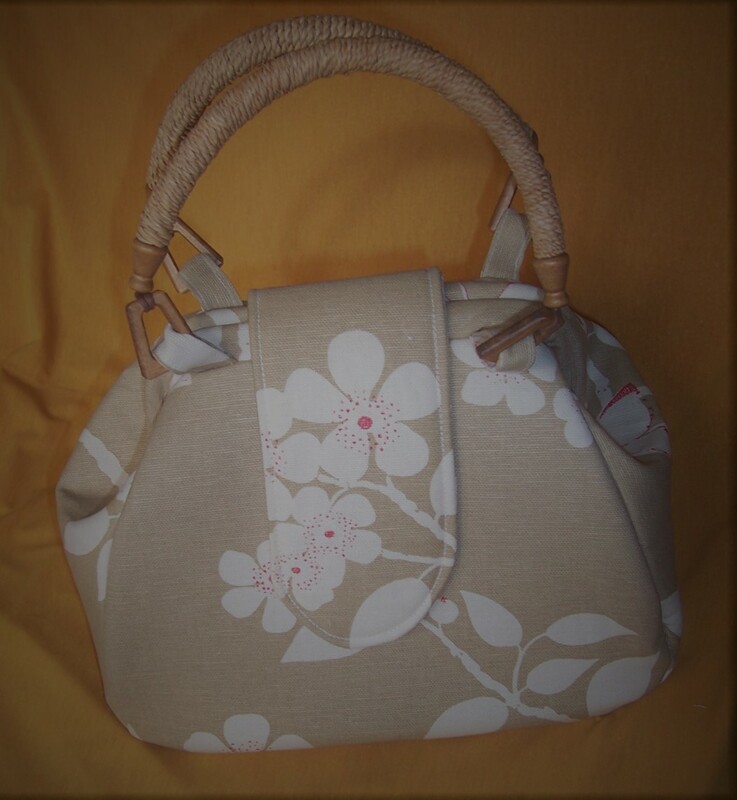 I have been absolutely delighted with the bag which I feel represents the culmination of all my bag-making learning rolled into one beautiful project. 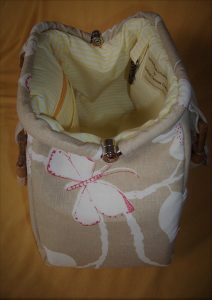 The outer fabric was some gifted linen that had originally been destined for landfill, the lining is a Lemon/White pinstripe cotton donated from a neighbour’s de-stashing last year. The zip was from my stash acquired when my father worked at the Opti-lon zip factory over 50 years ago. The handles were in my stash and still marked up with a price of £5.50 so must have been lurking for a considerable length of time as I note current price is around £14 for a similar set of handles. The magnetic snaps were in my bag-making stash and cost about 50p per set. The 8½ inch bag frame which cost £7.10 and the headliner* foam wadding bought for about £2.75 were the only new purchases – both from eBay. 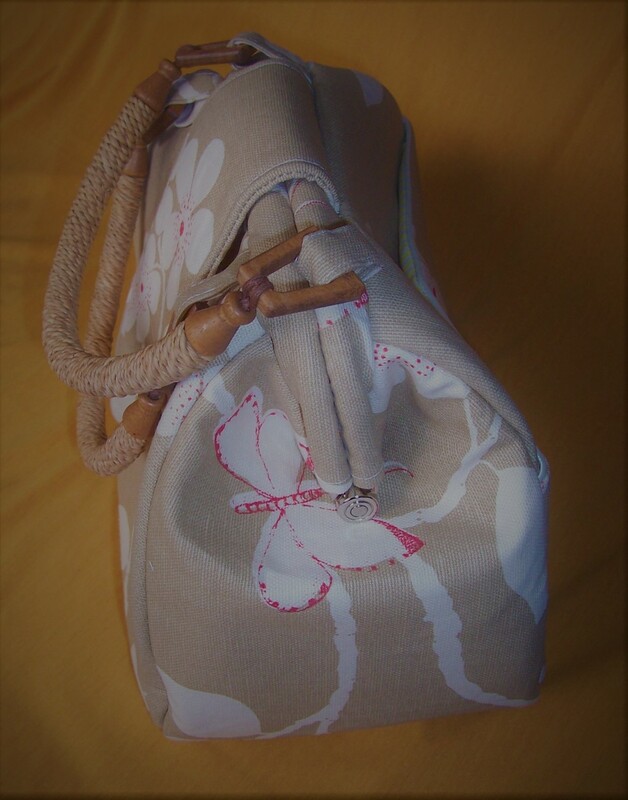 The bag was not a quick make as I completed the construction over 3 sewing sessions of about 2 hours each session. It would have been a lot quicker if I had not changed my mind about the accent fabrics AFTER they had been cut out, interfaced and basted to the headliner fabric! So I had to cut new pieces to be interfaced and applied to the headliner wadding. That all takes time! The outer pocket is trimmed with some Cream satin piping that I bought about 15 years ago at a Doll Fair. It was only when taking photographs that I noticed it is on the slant. 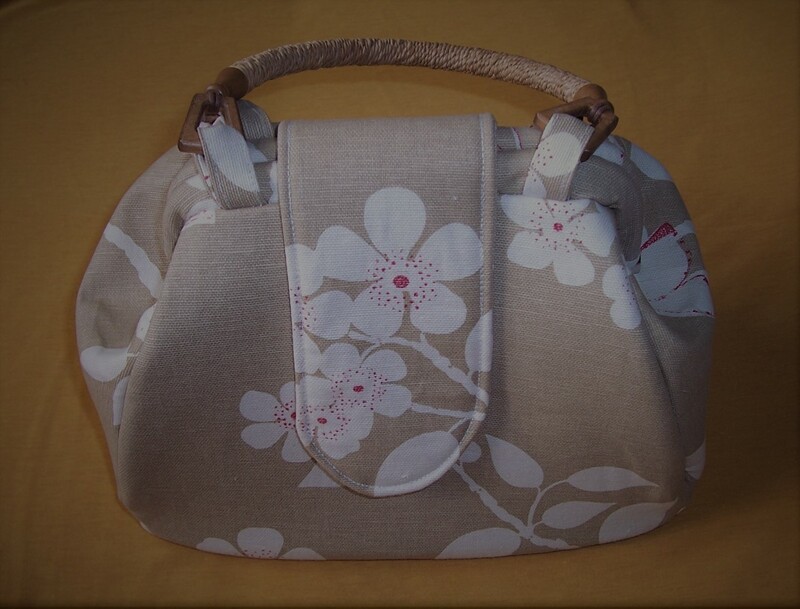 However, I quite like the look as it exposes a little more of the floral print on the side panel of the bag, a happy accident. 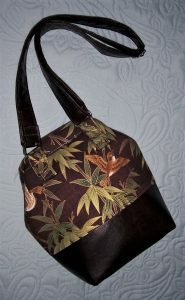 I did make one addition to the bag and that was my signature clip hook just inside the top of the bag. Attaching my keys to this clasp prevents the inevitable scrabble around the bottom of the bag in search of those pesky keys! 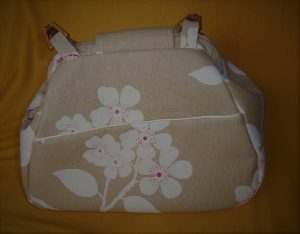 The fold over tab which I made to my own pattern has been ‘fussy cut’ to feature the floral print. However, underneath is hidden an error on my part. I did not put the corresponding magnetic snap in the correct place. So now there are two but fortunately the original incorrect placement is hidden by the tab. Phew! The bag frame slots into the hinge and has some teeny, tiny screws which were a challenge to deal with but luckily my husband had just the right-sized screwdriver. Feeding the frame through the channels was also a tight fit but finally it does look good. 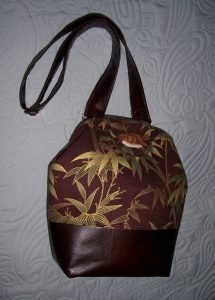 Although I prepared a nylon mesh bag base panel this was not used as I did not have any brass-coloured bag feet to hand. Still the bag base is set aside for the next iteration so will not go to waste. Flushed with the success of this small-sized Companion Carpet Bag, I have now ordered the larger bag frame – watch this space for iteration #2! * headliner is a substitute foam for the In R Form Bosal Bag & General Foam Batting. Whilst I am still undecided about which dressmaking project to undertake next, I have made another bag. This time inspired by Sian of Kittenish Behaviour, I tried out the Mabel bag which is a free pattern from Swoon. To make the bag I used a Fat Quarter of linen-look that I bought at Festival of Quilts for £1 plus another fat quarter of cotton print from my stash for the lining. The outer flap is made with some Cerise Pink needlecord that I had ‘knocking around’ in the sewing room! The magnetic snap and wadding came from my stash so this bag has not cost me a great deal in materials. However, I am not ‘over-the-moon’ about the bag. It is all my own fault as I should have read the instructions and made a note of the requirements – Shapeflex and Peltex, neither of which do I have in my stash of bag-making materials. Instead I used headliner* and thus the bag is not nearly as structured as it should be. I also failed to take into consideration the ½ inch seam allowance that reduce the already quite small bag down to a much smaller bag, not large enough for my day-to-day requirements! 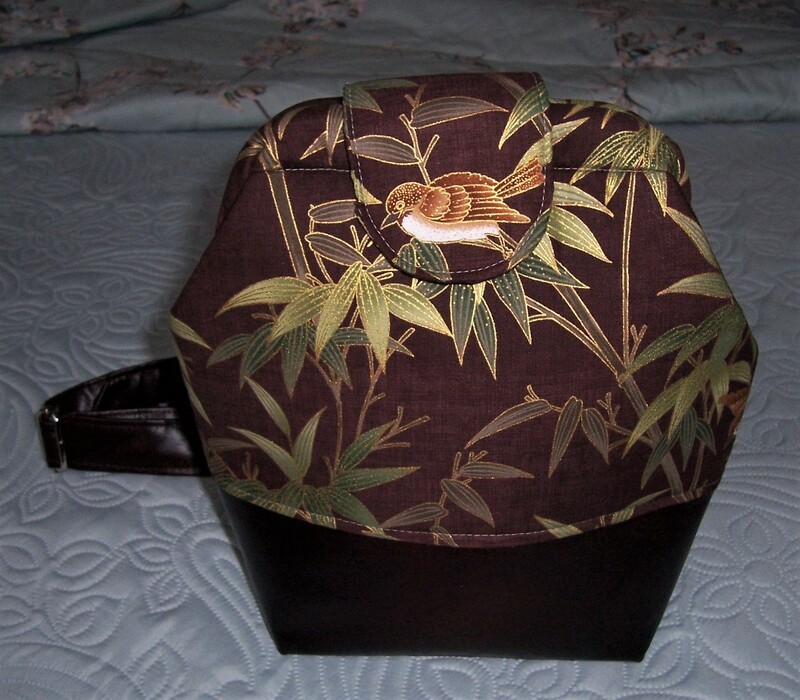 The finished size of my bag comes out as 9″ wide x 5½ ” high x 3″ depth. However, I continued with the construction taking note of the split in the wadding that happens within the flap and had I used the correct stiffening, would have made a much better job of forming the fold over the bag. The flap fastens with a magnetic snap. The little (looks like a caterpillar!) handle was a new construction technique for me and looks quite cute. I have added pockets (why make a bag without pockets?) in the form of a slip pocket on one side and a letterbox zip pocket on the other side of the lining panels. I also added a loop onto which you can attach a key ring that will stop the keys disappearing to the bottom of the bag. Again I have learned a few more details about bag construction (such as reducing the top width of the gusset and cutting back the headliner at the top of the bag) which if I ever make this bag again, I will incorporate into the next iteration. Meantime, this particular model is destined to be filled with small items of cosmetics etc., and parcelled up as a gift for my sister. * a substitute for Bosal foam wadding. A recent promotion on the Sewing Quarter featured two bags by Mrs H. The first was the Squiffy Sling bag and the second the Companion Carpet Bag. 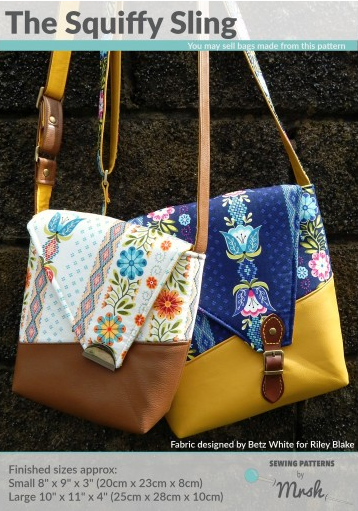 A while ago I purchased a paper copy of the latter as part of a gift to a friend but now having seen the frame bag made by Adrienne, I decided to purchase a second (pdf) copy of that pattern for myself. 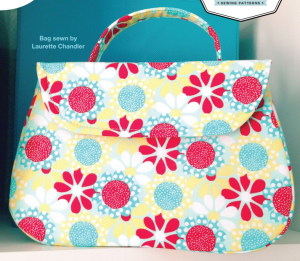 Whilst browsing the website and reviewing the feature on SQ I was intrigued by the Squiffy Bag and so purchased that pattern as well. 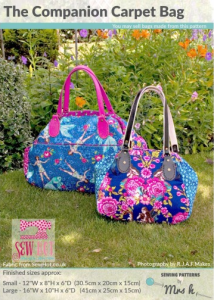 Overview: Although the Squiffy Sling pattern is designed for beginners, the clever construction of this cross-body bag makes it an interesting sew with a quirky finished bag perfect for everyday use. 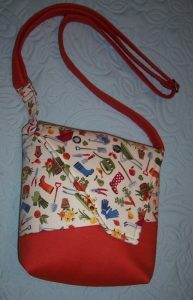 The Squiffy Sling was designed for the Winter 2017 Bag Retreat with Mrs H.
As this bag involves some ‘new to me’ construction methods, I decided to make the first bag in the smaller size. 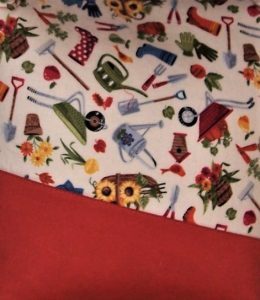 I used some of the fabric that came as part of a kit for making padded covers for Lever Arch files. The fabrics are 100% cotton with one featuring a print of gardening motifs plus a coordinating plain in a lovely Terracotta colourway. I selected brass hardware from my stash and printed off the pattern and instructions. To ensure that I made no ‘newbie’ errors, not only did I read through all the instructions, I re-visited the tutorial and also took advice from a friend who had already made the Squiffy Sling bag. The first task was to apply a fusible interfacing on the outer fabric, the contrast panel, the lining and the two pocket pieces. I also applied headliner* wadding to the outer bag. Usually when making a bag, one tries to keep everything straight and symmetrical but the charm of this particular bag is that it is ‘squiffy’! I completed the window zip insertion for one pocket and made the slip pocket using some of the print fabric. A slight change was that I stitched a dividing line of on the slip pocket so that my mobile phone, notebook and pen would sit tightly in the pocket. A new method of construction for me was to leave the bottom part of the zip pocket open to facilitate the bagging out of the bag. In the past I have always turned bags through an opening in the base of the lining, or slipped the lining inside the outer (wrong sides together) before stitching together at the top. 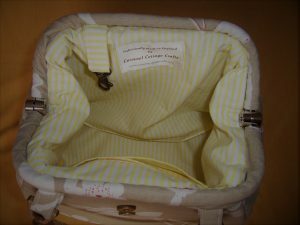 I particularly liked the fact that the lining has a separate pattern which is deliberately drafted slightly smaller than the outer thus ensuring a snug fit with no excess bagginess in the lining. The construction of the strap was also new to me. 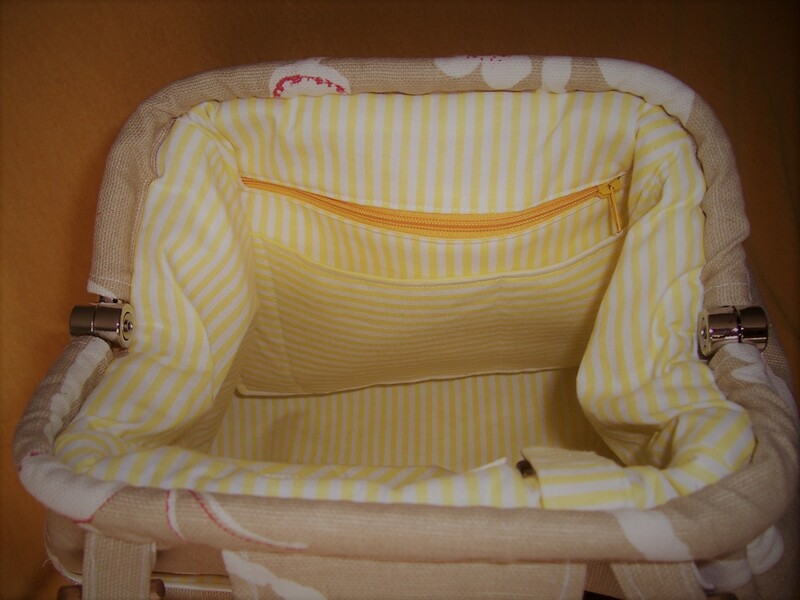 For this bag you need only one rectangle (or D ring) plus a slider so that the strap can be adjusted in length. I shall certainly use this method again on future bags. The only slight hiccup that I had was ensuring the correct placement of the magnetic snap but by folding the flat fabric pieces over I was able to mark the placement and will now know for future makes of the bag. Stitching all around the outer and lining before bagging out through the zip pocket was an ‘interesting’ experience but it did work well after a short tussle. Next time I will use a longer zip so that it is not such a squeeze! I am delighted with the bag which has turned out well, and is just the right size. 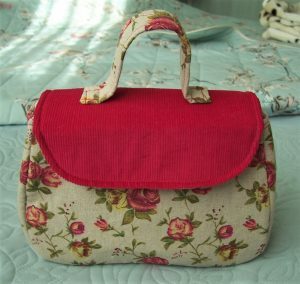 I have learned a lot and am already planning the next iteration before progressing to the Companion Carpet Bag. Recently I noticed that the Virginia Creeper on our garden fence was changing into its Autumn colours. 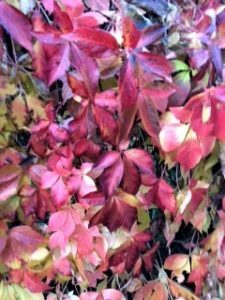 I love all those great hues of Rust, Terracotta, Orange, Tan, Purple, Burgundy and am pleased that having been ‘colour coded’ I am classed as a ‘Deep Autumn’. These colours are exactly right for my palette. 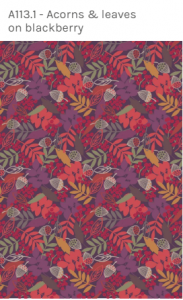 Browsing through my stash of cotton fabrics I came across this length of pre-washed cotton print from the Lewis & Irene stable. 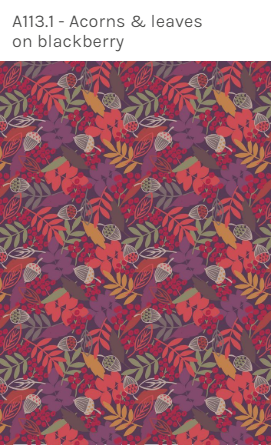 The print is their Autumn Fields range and this particular colourway is Acorns and Leaves on a Burgundy background. I had just 2.4 yards (2.2 metres) of 42 ins wide fabric and as far as I can remember this cost just £5/metre in the sale at New Threads Quilt Shop a couple of years ago. This length was originally purchased with a view to making a long-sleeved blouse. Now that I have ‘nailed’ the sleeveless shirt dress I decided to see if there was sufficient for dress #3. I was able to cut out the pattern from this minimal amount of fabric but there was not quite enough for the under collar, armhole bias and one side of each pocket bag which are cut from the brown spotted fabric I have purchased ready for the lining of a swing jacket. Construction was plain sailing and I was fortunate in finding just the right colour and size of buttons. There are 12 on the front bodice and skirt. The skirt length is just 24 inches with a 1 inch hand sewn hem. 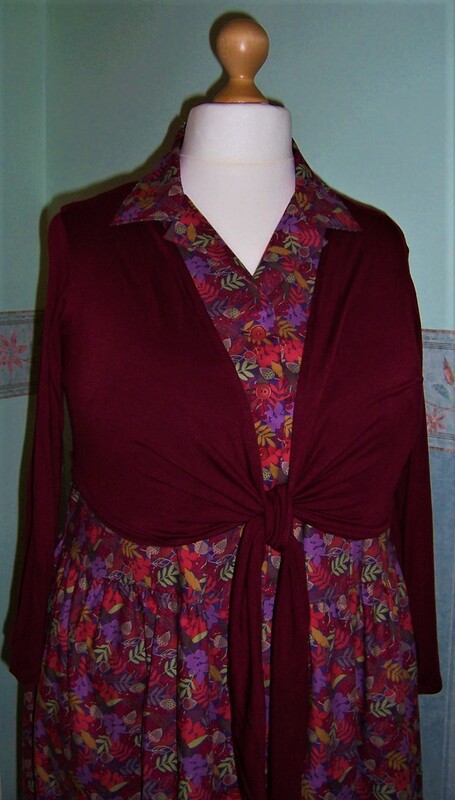 The dress fits well and coordinates beautifully with my Burgundy tie- front cardigan. 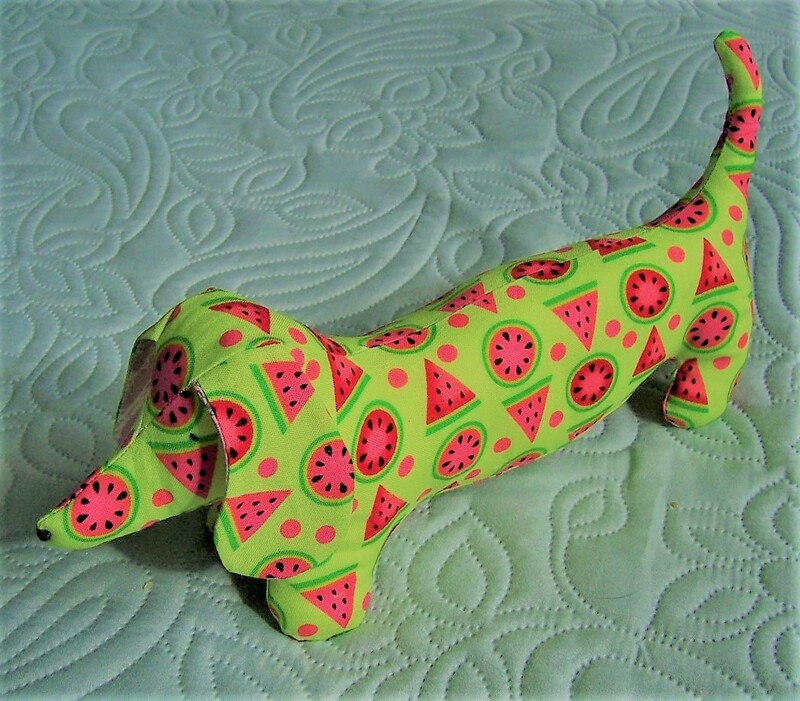 As mentioned in previous postings, I regularly make and teach ‘how to’ a Dachshund Pin Dog. 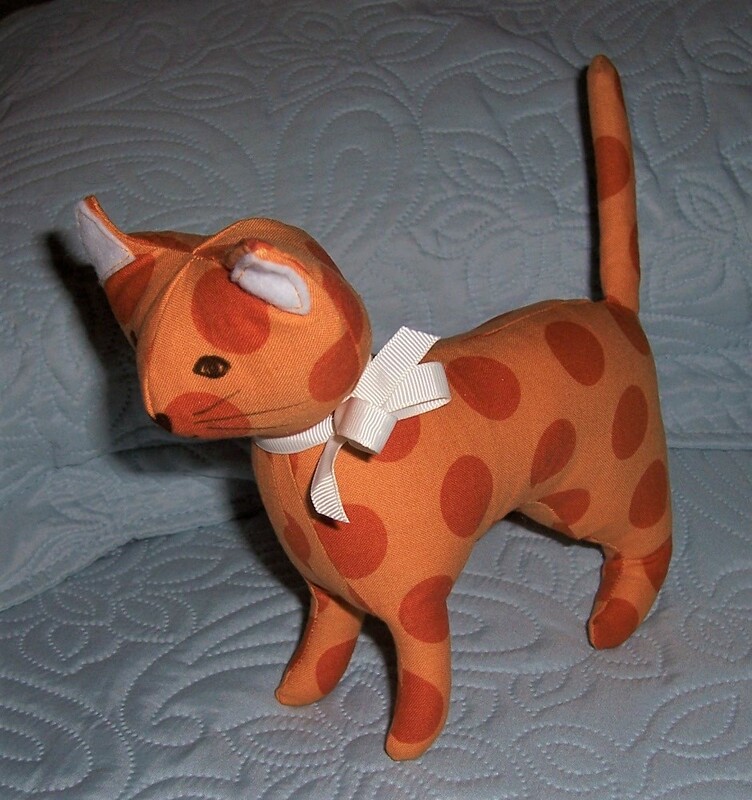 Personally I am more of a cat lover so thought I would make my very own Kitty Cat Pin Cushion. After surfing the internet I came across a free pattern for Terry cat. (http://dollmaker.nunodoll.com) that I printed off. 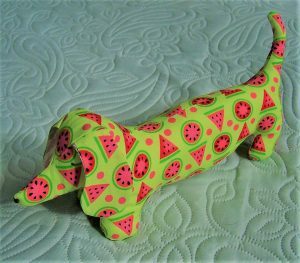 The instructions were rather sparse and were originally been designed for construction from towelling, so it was a good thing that I have previously made stuffed toys. 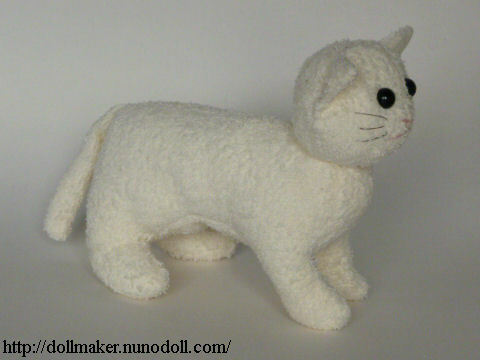 Here is the first version of Kitty made from a scrap of fat quarter of quilting cotton. I have used a felt tip pen to draw in her features. She is not perfect as her head definitely requires some ‘finessing’. For now though, I have a ‘jumping off point’ to perfect my pet pin cushion.